Q: Who invented water rockets? 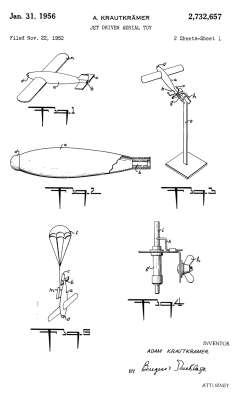 A: I have found no online citation for who invented the water rocket, but a few hours spent searching in the US Patent Office archives yielded some interesting evidence. There are a large number of patents relating to toy rockets and guns, including the famous Park Plastics 2-stage water rocket. Patents before 1972 are not searchable for text, so this is a very slow process. If you find any additional relevent patents please send me a note. 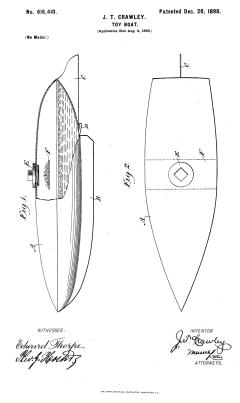 December 20th, 1898 Patent #616,410 entitled "Toy Boat" uses a water jet driven by compressed gas, generated chemically, to propell a small boat. Vinegar and baking soda? January 31st, 1956 Patent #2,732,657 entitled "Jet Driven Aerial Toy" is propelled by compressed air and water, but is more airplane than rocket. 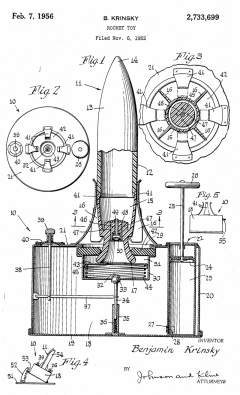 February 7th, 1956 Patent #2,733,699 entitled "Rocket Toy" is an elaborate self-contained rocket system for the new "space age." Compressed air driven, no water mentioned. 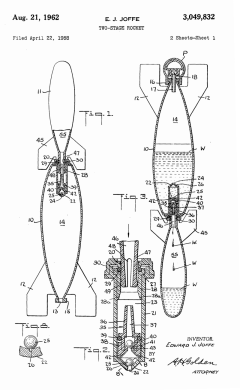 July 31st, 1962 Patent #3,046,694 entitled "Jet Propelled Toy Arrangement" demonstrates the use of water and a "water soluable gas generating pellet" as the means of propulsion. 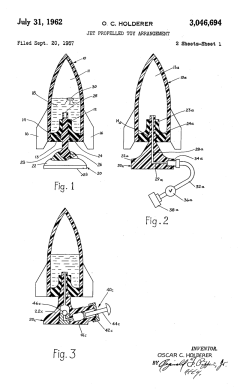 Aug 21st, 1962 Patent #3,049,832 entitled "Two Stage Rocket" is the pinnacle of the Parks Plastics water-rocket line. I have yet to find a patent for the original single-stage rocket.